The Kuiper Belt is names after its discoverer Gerard Kuiper in 1992. This is the area beyond the orbit of Jupiter, but still under the gravitational pull of our Sun. It contains Pluto, other dwarf planets, and miscellaneous icy objects. It is similar to the Asteroid Belt, but it is far larger—20 times as wide and 20 to 200 times as massive. Like the asteroid belt, it consists mainly of small bodies, or remnants from the Solar System's formation. Although some asteroids are composed primarily of rock and metal, most Kuiper belt objects are composed largely of frozen volatiles (termed "ices"), such as methane, ammonia and water. 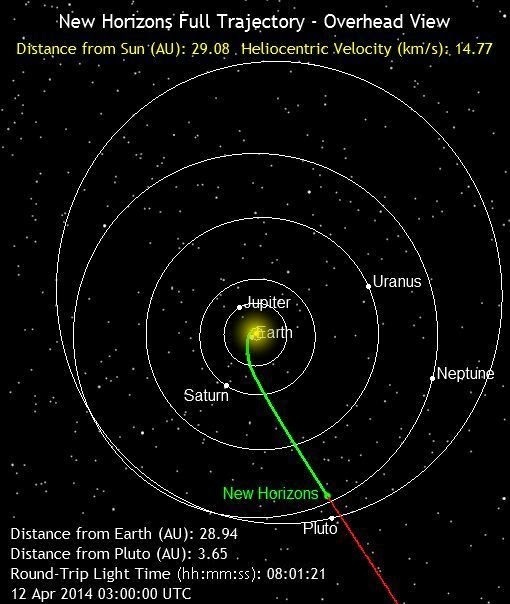 In 2006 NASA dispatched an ambassador to the planetary frontier: The New Horizons spacecraft, now more than halfway between Earth and Pluto, is on approach for a dramatic flight past the icy dwarf planet and its moons in July 2015. It's mission is to find the origin of Pluto and it's moon Charon. 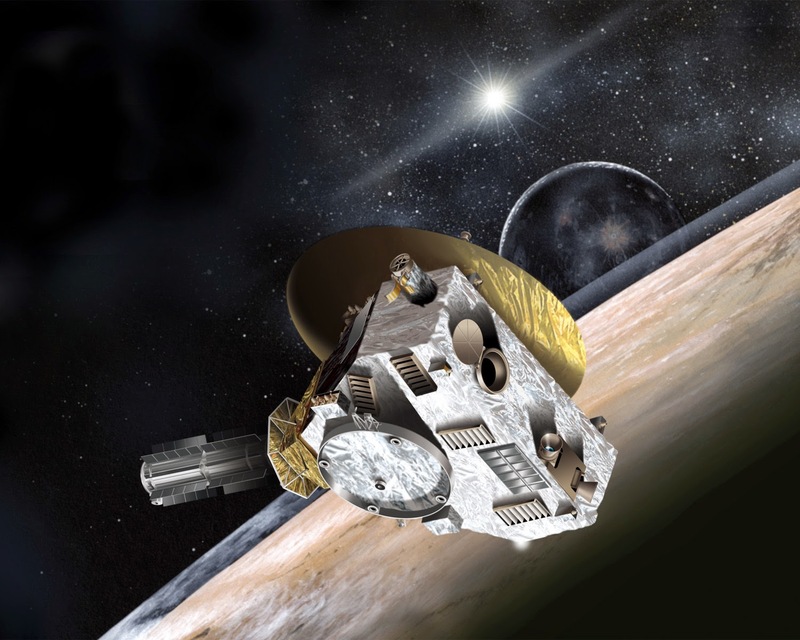 After 10 years and more than 3 billion miles, on a historic voyage that has already taken it over the storms and around the moons of Jupiter, New Horizons will shed light on new kinds of worlds on the outskirts of the solar system. Did You Know: An Astronomical Unit (AU) is 93,000,000 miles, or the distance from the Sun to the Earth. 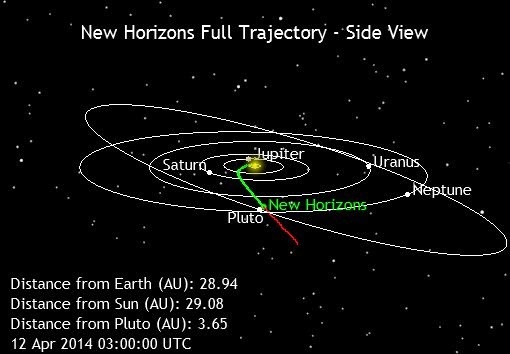 Fun Facts: New Horizons is about 29 AU’s from Earth and about 3.5 AU’s from Pluto. It will take 4.5 hours to relay a transmission. Hi Stephen, I think I have heard about the Kuiper Belt, maybe I must have read about it somewhere. Thanks for all these informative posts. I never knew this, thanks for sharing! I had heard about the Kuiper Belt but this has explained it more fully, thanks Stephen. Didn't really know about New Horizons though. What interesting information it can relay. Under the circumstances, 4 1/2 hours is pretty quick. Ten years (or more) to get to Pluto... and there are still people who think we can travel to other planets? Distances are just too great. Maybe they'll find Pluto is still a planet after all? We will definitely need to beam people around the universe(s) if we're going to stay connected in a reasonable length of time. Very interesting facts here today. This is so exciting. There's so much to learn. Very interesting, Stephen. I sketched the universe in which my scifi story is set. I stay on the NASA newsletter list. I'll always pop in here for a science related post. I SO enjoyed reading this. Very different from what I've been reading while on the blog challenge, and definitely something cool to learn! 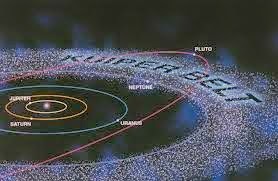 The Kuiper belt was named in 1992? Really? That late? Never heard of this belt, thanks for all this interesting info, Stephen! What a great subject for the A to Z. And thanks for the large font, a blessing for my tired old eyes. Every year in my 5th grade class we do an astronomy ABC research project. Kuiper belt is everybody's K.
Always educational when I stop by here Stephen. Watch me work AU into the conversation tomorrow. Thanks. Wow! I've heard of the Kuiper belt, but the explanation was no where as good as yours. Great post and thanks for the clear info!